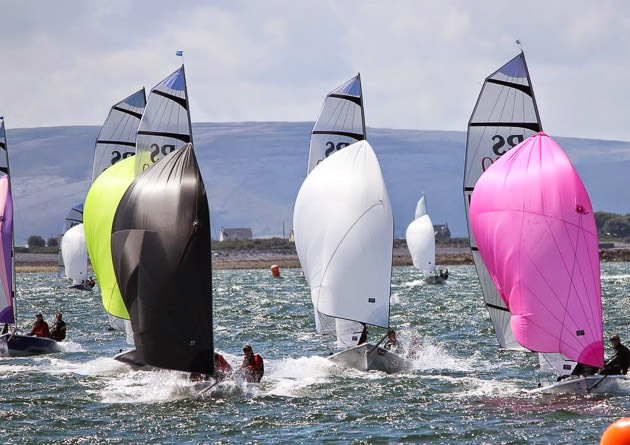 The RS400 Class descended on Galway Bay Sailing Club (GBSC) from the 8th to the 10th of August to compete in the class’s 2014 National Championships. GBSC rose magnificently to the occasion with its members providing amazing support for the event. Launch and recovery was aided by a team of helpers, and the race officer and commodore David Vinnell and team were outstanding throughout, providing a tactical and interesting race course every time. All races were sailed in planing conditions. For the strong breezes, the sea was tame for the west coast, but was still challenging, as crews worked for each wave upwind and down. True beats and good lines make for great racing and we had them throughout. After an opening day and 4 races, McCready Sailboats sailed by Gareth Flannigan and David Fletcher were showing the form of past and future champions and led clear of the pack. There was to be no resting on ones laurels however as several boats were still within striking distance with a gaggle of teams on 12 and 13 points overnight. It was a fast and furious day, with no let up from hiking after the weather mark, and no shortage of adrenaline as the fleet came thundering downwind trying to out gybe and think each other on lay-lines. With 3 rounds, there was ample time to work your way into better or worse positions on the race course. Interestingly the following pack included sailors from every corner of Ireland, showing how strong the class has now become throughout the country, including “The Full Irish” single handed sailor Dave Kenefick who at his first event teamed up with Sandy Rimmington of MBSC eventually finishing 11th overall, David looking exhilarated after day one, described the boats as “all the fun of a 49’er without the swims”. 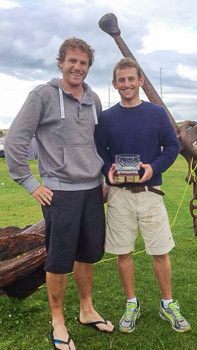 Richard Leonard and Alex Barry winners of the 2014 RS400 National Championship. Day two was to be very similar and just as exciting and with as much fun as day one. The story was of another team now sailing like champions and leading the pack. Alex Barry and Richard Leonard of the RCYC and MBSC were now sitting clear by a few points from Sean Cleary and Steven Tyner, the talented pair from GSC who were Eastern champions earlier in the season. Also a prominent challenger now was the UK pairing of Howard Farbrother and Dan Martin, who had featured well in the Europeans at Garda recording a seventh. Two Irish 400’s had also made the trip to Garda for the Europa cup recently with Emmet Ryan and Jay Stacy finishing 10th and David Rose and Ian Heffernan Finishing 12th at that event and both teams were in the hunt here, as was the ever present Dave Cheyne and Richie McCullough. These teams were to fade away however by the end of day two when the final discard was applied after 8 races. The Race officer had his regatta and called time on proceedings. It’s a testament to the three classes that no rigs were lost for the entire event, and apart from some worried competitors all was okay and the fleets got home safely to finish what had been a fantastic 3 days sailing out of GBSC. When the dust settled, Alex Barry and Richard Leonard of RCYC and MBSC had won the 400 Nationals, followed by Howard Farbrother and Dan Martin from QMSC and Sean Cleary and Steven Tyner in third. This movement of accessible high performance sailing dinghies continues to bloom, and be enjoyed by a wide variety of competitive and enthusiastic sailors of all ages. The classes are supported by the ever present and well stocked McCready Sailboats, who at the drop of a hat delivered a new rig and even helped set it up for the unlucky 400 sailors who damaged theirs on the way to the event going through a slightly low toll gate.